When you think of the symbols of Halloween, witches and things that go bump in the night probably come to mind. 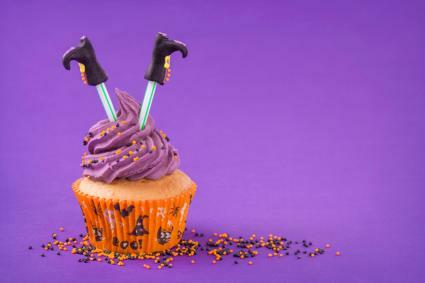 That's why a batch of witch-themed cupcakes are the perfect treat to whip up for a class party, pass out to friends and neighbors, or make for your own family. The only real requirement for a witch cupcake is a good hat, and there's no better way to create one than with an upside down ice cream cone. The result will be similar to the cupcake pictured above. Cover the top of the cupcake with green icing. Make a face on the top of the cone by placing two brown or red M&Ms for the eyes smack in the center of the cupcake. You must leave a bit of room at the top for the cone hat. Pull apart the licorice and use kitchen sheers to cut two straight eyebrows and place at an angle above each eye. Use a piece of candy corn for the nose. The white tip should point outward. Create hair and a straight mouth with the licorice. Place the chocolate cone above the eyes to represent the hat. The open portion of the cone should be on the bottom, on the cupcake and the pointed part should be at the top. If you'd like, you can coat the point of the cone with melted chocolate prior to placing it on the cupcake. Create a witch's head and face from large marshmallows that are colored and topped with fondant hair and hats. Start by icing the top of the cupcake with chocolate ganache. If desired, you can put buttercream below the ganache. Take a marshmallow and color the skin of the face in a color of your choice with edible coloring pens/food markers. Gray and green work well for witch faces. 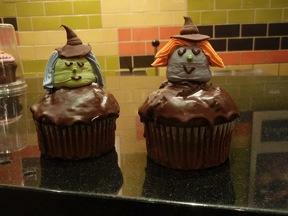 Roll out the orange and gray fondant and cut out strands of hair for each witch head. Secure to the top of the marshmallow with a dab of buttercream icing. Using black buttercream icing and a small round decorating tip, pipe on simple eyes, a dot for the nose and a small mouth for each face. Use the fondant to shape a small black witch hat. Start with a small ball and flatten for the base of the hat and then create a cone to complete the hat. Use the buttercream to glue the base and cone of the hats together and then on the marshmallow heads. Place each marshmallow head on top of the iced cupcake. Affix with a little of the buttercream icing. Decorate a fun cupcake that is as creative as it is delicious. Place the purple icing into a decorating bag with a large star tip. Pipe a mound of icing onto the top of the cupcake and pull up, ending with a point. Sprinkle on orange and black sprinkles. Take a straw and cut it in half. Place the fondant boots on ends of the straws and push the straws down into the top of the cupcake about an inch apart. Be sure the boots are pointed with the tips of the toes facing out. Cauldron cupcakes - Better Homes and Garden magazine has an online recipe that describes how to make these witch's cauldron cupcakes. 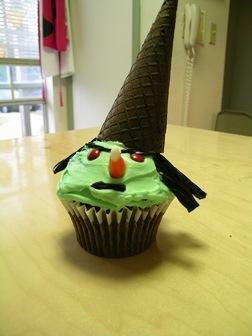 Green witch cupcake - The queen of homemaking, Martha Stewart, offers an idea that uses simple candy pieces to make a green-faced witch decoration to top a cupcake. Beautiful silhouette witches - Country Living offers a truly unique idea for gorgeous witch silhouettes that are made from fondant and placed on top of an iced cupcake. The black against white lends an elegant look to any Halloween event. Serve witch cupcakes together on a platter or arranged in a cupcake tree. Decorate the display with bold colors and a painted backdrop of a haunted house or a life-sized black cat. Prop a broomstick against big displays, and play a loop of cackling sound effects for a truly wild, fun, and delicious Halloween party!